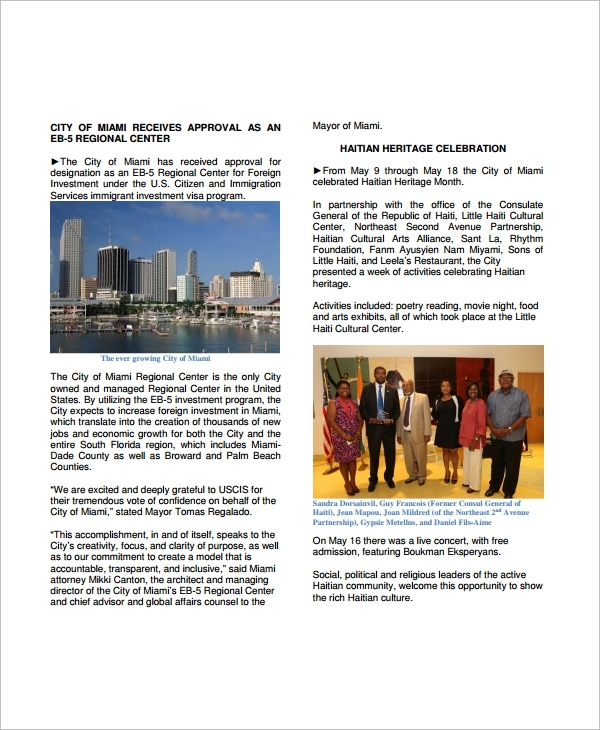 An office newsletter template is used to make the office newsletter, and this is an easy to use and easy to customize file type available in Word or PDF file formats. 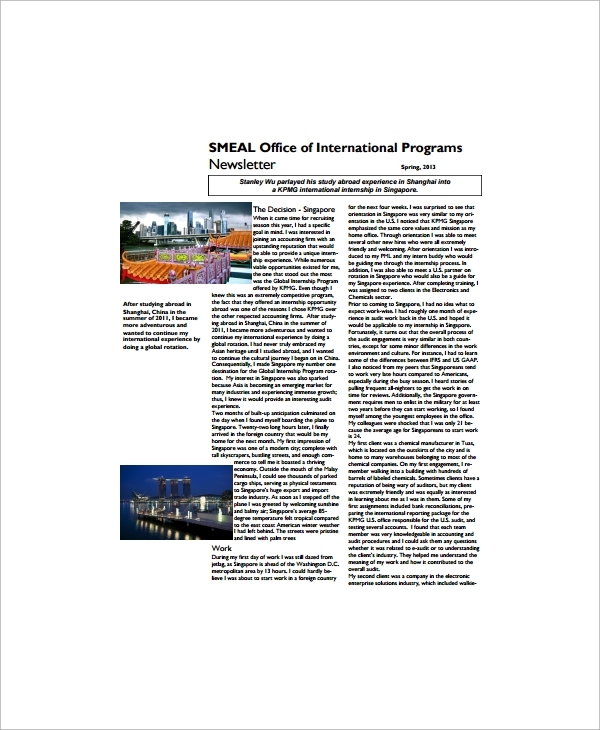 You get ideas on making the layout and formatting, and styles of office newsletters in the most presentable way. If you are short of ideas to design an office newsletter, then you would love to use these templates. They give you a ready style and format which you may fully copy or take ideas from to make a smart looking newsletter. You may like Corporate Newsletter Templates. The template is used for making newsletter and you may implement this anywhere, whether in business, office, academic institution, etc. In all such places, you will be able to get the newsletter to tell about things, make circulars etc, and these you may do using the attractive format which will fetch reader attention. 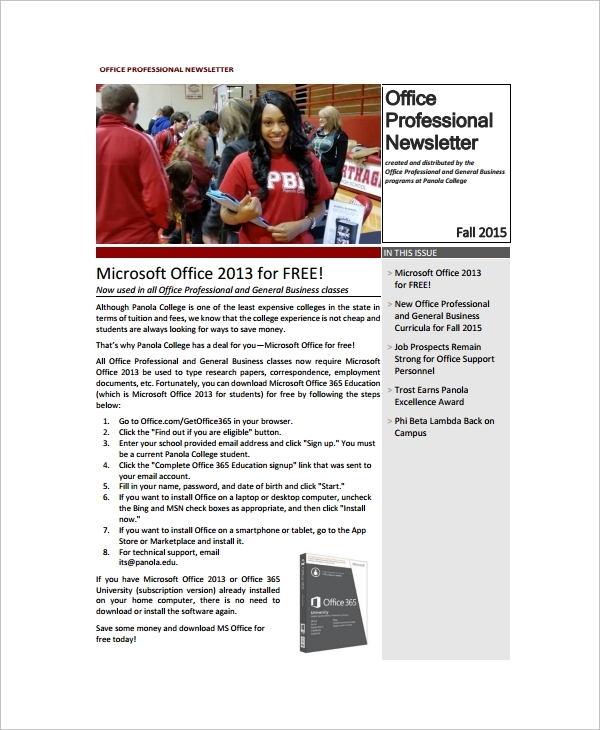 The free office newsletter template is what you use to show off the office workings, details, some important news or announcement or commencement of some news schedule, professional course, etc. 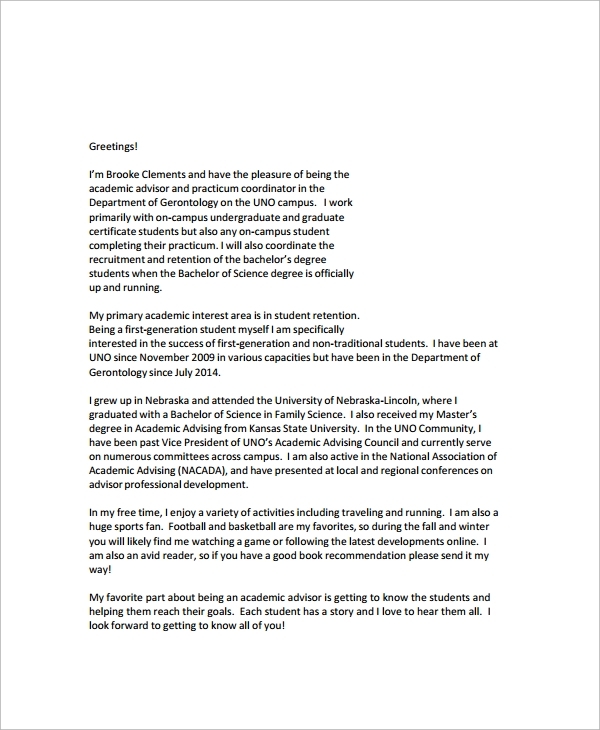 You may use this template for official purpose, and also in schools and colleges to make some attractive flyers or newsletters for the students. 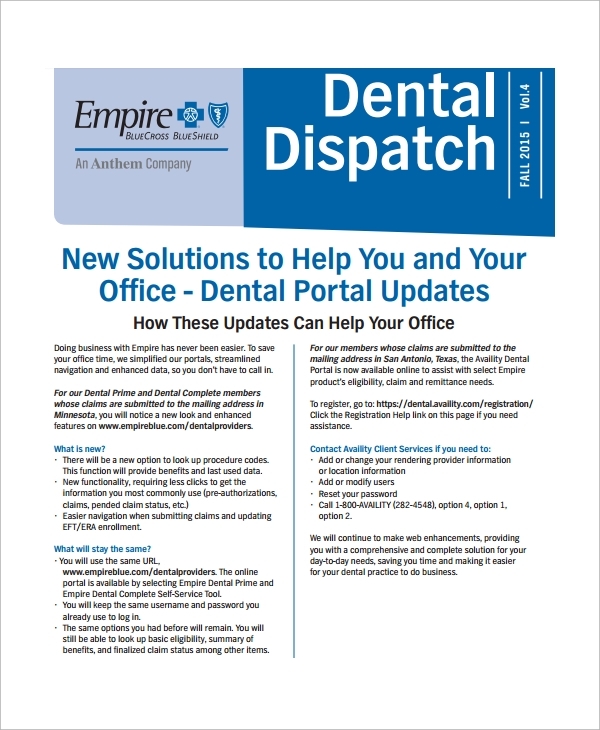 If you have to write a newsletter about a dental clinic or some dental course etc, that is anything which refers to dental, then you can refer to this template for a suitable format. This will help you get through easily without making a dull and unattractive interface of the newsletter. 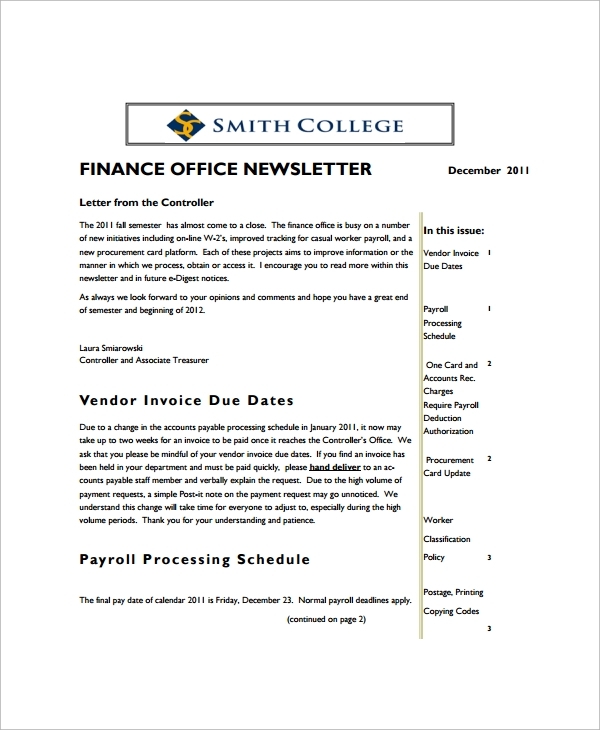 What are the Office Newsletter Templates? The office newsletter or email newsletter templates are formats or readymade guides which you can refer to, to make newsletters for your office or organization. These templates are smart and handy, and can be used in flexible ways to get ideas, use the whole concept, or just use the layout style etc. Whether you use the full template newsletter or just a portion, it all depends on how you will make the layout work for you to give the newsletter you are designing a complete stylish look. You can also see Email Newsletter Templates. But when you have simply no idea or experience of designing a newsletter, then the office newsletter templates are the best friend you can get to make you a professionally perfect and officially standard newsletter. 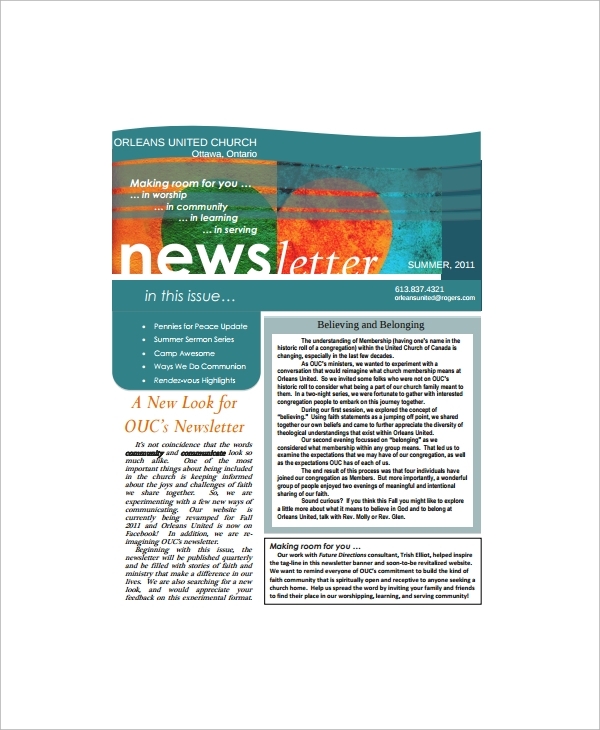 You may also like Employee Newsletter Templates. 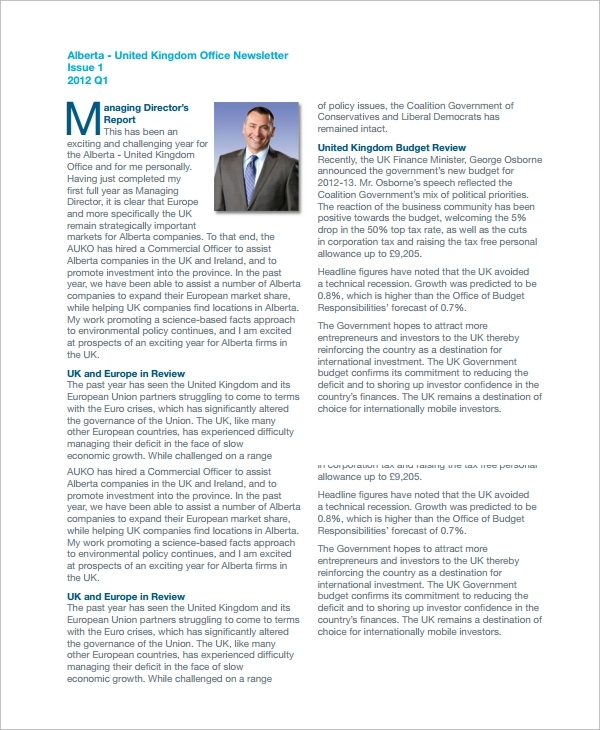 What is the Importance of the Office Newsletter Template? What is the public’s reaction to newsletters? It’s simply ignorance in general. People ignore and close newsletters, and the reason for that is they just get bored and don’t get attracted to the look. However as you know that one of the strongest marketing partners are newsletters, and they help you connect and communicate with your customers and associates, you may not quit making newsletters. Rather, you need the style and flash. As you add them to the boring ways, you get something new, flashy and attractive to give to your readers. There is the job of the template to help you give that getup to your office newsletters. You can also see Holiday Newsletter Templates. The best way to use the templates is by downloading them free and studying the style to know what you may use from them. You may simply get inspired and use the style for writing, or the layout, or the font styles or the use of spacing and formatting. But then again, you may get the whole pattern interesting and you can simply overlay that using your own information. That is what you say personalization, and this will give you the best newsletter format which none of your readers may reject reading. You may like Monthly Newsletter Templates. If you are sure that you want to make a difference through your writing of office newsletter and make an impression on your readers, you have to try something that is bound to succeed. The newsletter formats you get online are made by the experts in the domain, and they know how to make readers stick to the content. That is why using their suggested ways will give you a great formula to succeed.